The global thermal printer market has witnessed an impressive growth over the past few years, following the rising demand for barcode printing. Barcodes are printed on the packaging to trace product information about the product, which efficiently enables accurate product tracking, minimizes manual error, and reduces labor cost. Thermal printers are widely used for printing barcodes as they are cost-effective, have high speed, and deliver high performance. The global thermal printer sales are expected to surpass a value worth US$ 4.5 Bn by 2028 end. Over 2018-2028, the market is likely to expand at a promising 6.6% CAGR. Among end users such as retail & consumers goods, institutional and industrial, it has been projected that retailers and consumers goods, including sub-sectors such as grocery product, food & beverages, clothing & apparel, and others, will maintain dominance through 2028. However, the institutional segment, including hospitality, hospital & healthcare, and banking & financial services, will reportedly exhibit a higher growth rate owing to increased use for receipt and ticket printing. High adoption rate among retailers and wholesalers will remain a key factor instrumenting the growth of the global thermal printer market over the next few years. The demand is expected to be on the rise, as retailers and wholesalers require printers to print invoices receipts, barcodes, tags, and other important information, for which they prefer cost-effective printers. Since thermal printers have low cost and better performance compared to their other counterparts, they will reportedly remain a preferred choice for retailers and other end users worldwide, through 2028. While North America and Western Europe are presumed to secure the top market positions in terms of sales of thermal printer, research indicates that developing economies of APAC, MEA, and Latin America hold significant growth opportunities to benefit the market in near future. APEJ has been foreseen to see healthy growth during the forecast period, owing to rapidly progressing markets in China, India, Australia, and New Zealand. Eastern Europe will also witness promising growth prospects, attributed to solid growth projections for Poland. 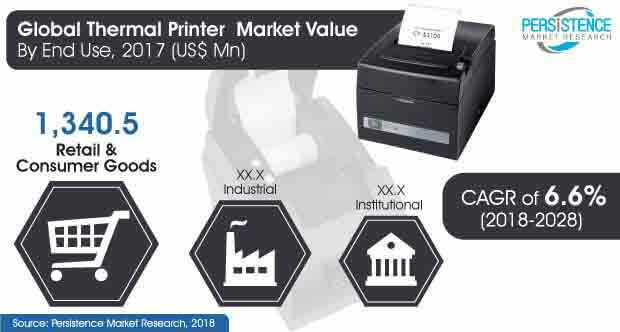 Prominent players of the thermal printer market are foreseen to focus more on technology upgrade and frequent product launches as the key strategy to cater to the evolving demand. Companies such as Zebra Technologies Corp. have introduced a new version of desktop thermal printer, specially designed to meet the growing demand from healthcare, retail, and manufacturing industries. Also, the company emphasizes and invests in research and development to bring out new series of mobile printers. Other leading companies in the global thermal printer market include Avery Dennison Inc., Seiko Epson Corporation, Toshiba Tec Corporation, TSC Auto ID Technology Co., Ltd, SATO Holdings Corporation, Honeywell International Inc., TransAct Technologies Incorporated, and Domino Printing Sciences PLC.